The Bay of Islands is an aquatic playground comprising 144 islands, beaches, swimming with dolphins, whale watching, big game fishing, scenic golf course and bush walks. Kauri forests are only 1 hour away. The towns are attractive and the scenery unspoilt. Enjoy the seaside shops and restaurants in Paihia. From the wharf opposite Paihia's main shopping centre, you can catch a passenger ferry to Russell on the other side of the harbour. 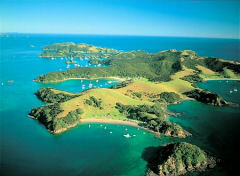 Close to Paihia is Waitangi, one of New Zealand's most significant historic places. The Treaty of Waitangi, which heralded the beginning of New Zealand as we know it today, was signed here. Nearby is a fully carved Maori Meeting house. Haruru Falls ('big noise') falls in a horseshoe shape - a rare phenomenon. A walking track runs between the falls and Waitangi. as they did in years gone by.